If you’re heading to Alaska on an Inside Passage cruise, you know that it’s hard enough work even to be certain how the names of various port towns are pronounced (Ketch-chicken? Joo-noo? ): Knowing what to expect when it comes to navigating these towns by foot, then, is another matter! Each port is laid out a bit differently, so it can be useful to have some background in order to inform your exploration. With this in mind, I’ve put together a brief guide to help you get around Juneau, Skagway, and Ketchikan during your time in port. The following Skagway Alaska map, Ketchikan Alaska map, and map of Juneau will help you orient yourself and give you a head start when the cruise doors open to release you into the Alaskan wilds! As enormous as the Last Frontier is, it can be easy to forget just how far apart the major ports of the Inside Passage are! As can be seen in this general map of southern Alaska, Skagway and Ketchikan, for example, are some 300 miles from one another even as the crow flies! Smaller than Juneau, but substantially more populated than Skagway, Ketchikan is a moderately-sized fishing port located along the southernmost reaches of the Inside Passage: If you’re northbound from Vancouver or Seattle, Ketchikan will likely be your first Alaskan stop. Situated on southwestern Revillagigedo Island, Ketchikan is a gateway both to stunning Misty Fjords National Monument and the fertile waters of the Northern Atlantic, where many of Ketchikan’s seasonal residents spend extended stints fishing for salmon, krill, and crab. For cruisers, Ketchikan is a fairly easy city to navigate: You’ll arrive at one of several berths (not docks! In this town, cruise docks go by a different name) located just adjacent to downtown Ketchikan, meaning it’s only a few minutes’ walk to most of the city’s highlights. You may want to head straight to the Ketchikan Visitor’s Bureau (1), just adjacent to the cruise docks, if you’re scheduled for a shore excursion: Many tour groups use this central location as a meeting point. You can’t miss it! Just look for the large bronze statue and the “Liquid Sunshine Gauge” out front! If you’re not slated for a Ketchikan shore excursion, you might want to stroll right into town. Just duck under the Welcome to Ketchikan Sign (2) and do some exploring! You’ll find the majority of Ketchikan’s shops and restaurants concentrated within a few square blocks. Later in the day, you may want to walk over toward Creek Street (3), Ketchikan’s iconic row of waterside residences. This colorful and unique neighborhood, variously inhabited across the decades by resident fishermen, humble shops, and even brothels, is a wonderful place to post up and search for the seals that often play in the wake just underfoot! Don’t worry if you manage to see most of downtown Ketchikan within just a few hours: There’s more to experience just outside the city limits. A few miles southeast of town, for example, is historic Saxman Village (4), where a number of painstakingly-carved totems stand on display for visitors to examine. Check out the Seward shame pole, one of my personal favorites! Taxis can be easily hailed for the five-minute drive to Saxman if you’re not in the mood for walking. If you are feeling adventurous, however, and want to stretch those cruise-softened legs, you may want to check out the Deer Mountain Hiking Trail (5), a gorgeous half-day route up to some stunning Pacific overlooks. (See this article for trail directions and specifics). Whatever you’re most looking to experience while in town, the Ketchikan Alaska map below should help you orient yourself for a day of exploration! And since you’re heading that way, you may want to click here to read up on some of the best spots in Ketchikan for breakfast, lunch, and dinner! Juneau differs somewhat from Ketchikan and Skagway in that the city both extends across a larger area and boasts many more full-time residents. Although Juneau is by no means a bustling mega-metropolis, its tens of thousands of inhabitants make for one of the most cosmopolitan stops, relatively speaking, along the entirety of the Inside Passage. With important roles both as an administrative center (it’s Alaska’s capital, after all!) and as a shipping port, this central Inside Passage outpost has more in the way of lower-48 amenities than you’ll find in, say, Skagway or Wrangell. Juneau also has a higher number of shops and restaurants than most other Southeast Alaskan ports (check out this article to read up on some of the best spots to eat!). For this reason, our map of Juneau Alaska focuses on those areas closest to the cruise docks. Because Juneau is a bit larger than its Inside Passage counterparts, visitors hoping to take in most of the city’s sights will have to work slightly harder than in Ketchikan or Skagway: It’s not an enormous area to explore, but downtown Juneau’s southernmost points of interest are at least a mile or two from its northernmost establishments. Assuming you’re inbound on a cruise ship, you’ll disembark near downtown Juneau, just adjacent to the Mt. Roberts Tram (1). This hard-to-miss Juneau icon has several cables stretching from its roof toward the mountains above, and you’ll likely see gondolas emerging every few minutes toward the sky. If you have an Alaska shore excursion scheduled, this will likely be the spot to meet your guides. On especially busy days, some visitors may dock at the slightly removed AJ Dock (2), but not to worry: It’s just a 10-minute walk, or an even briefer shuttle ride, from here to downtown Juneau. You’ll notice a number of jewelry stores, gift shops, and travel brokers in the immediate vicinity of the cruise docks. Don’t get stuck here! Instead, if you head toward the taller buildings just down the road, you’ll soon find yourself in Juneau proper, where most of the city’s older establishments are situated: the Red Dog Saloon (3), a historic Juneau feature, is one of the first buildings you’ll notice as you enter downtown. Stop inside for a drink, or keep strolling to check out historic downtown Juneau. Slightly further from the cruise docks, just adjacent to the waterfront, is another tough-to-miss Juneau landmark, the repurposed aircraft hangar that now serves as the Juneau Wharf (4). This stop, now a collection of restaurants and shops, marks one of the last buildings visitors will encounter before leaving “downtown” behind: Beyond this point, foot travel becomes a bit more difficult, and you may want to grab a taxi or bus if you want to check out Douglass Island, the “Valley” (Juneau’s closest thing to a suburb), or the more-distant Mendenhall Glacier visitor center. As you wind your way back to the cruise docks from this point, don’t forget to take a few minutes to check out the State Capital Building (5) and some of the other important administrative buildings unique to Juneau. These, too, are hard to miss: they’re some of the only multi-story buildings in town, after all! 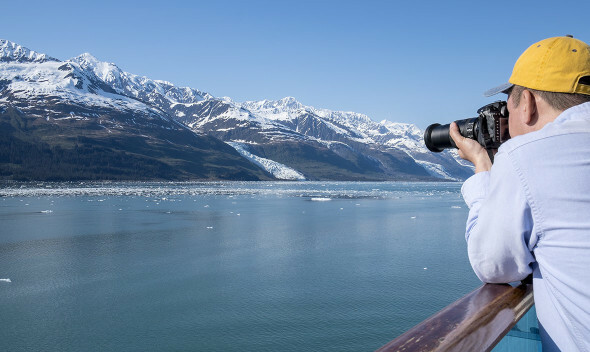 If you want to make your time in Juneau even more unforgettable, you may want to click here to explore some of our favorite Juneau shore excursions! Or, if you want to sample some of the finest dining nearby, check out this article for local tips on Juneau’s finest eateries! In either case, the following map of Juneau Alaska should help you orient yourself for the adventure ahead! At the very northern reaches of the Inside Passage, just before the lovely Lynn Canal tapers out, is the final Inside Passage port town on many northbound cruisers’ itineraries. Substantially smaller and more scarcely populated than Juneau or Ketchikan, Skagway’s isolation and lingering frontier-town appearance make it a hidden gem for the visitors lucky enough to spend time here. Even today, it’s not too difficult to imagine the bustling gold-rush that hit Skagway a century ago, when its saloons buzzed with activity and thousands of hopeful prospectors poured through the city gates en route to Yukon Territory. Importantly, Skagway is by far the most feasible Inside Passage destination for accessing the true interior. Indeed, it’s one of the relatively few destinations in Southeast Alaska that can be reached from the mainland by road! For this reason, Skagway can be the ideal stop for venturing into Canada: Outings like the Bennett Lake Scenic Journey and Yukon Discovery Tour, for example, provide a fascinating means for exploring the pristine landscapes around iconic destinations like White Pass Summit, Emerald Lake, and Carcross. If you’re cruising the Inside Passage, you’ll end up at one of three docks located just a ten minutes’ walk south of downtown Skagway. The largest cruise ships in port on a given day tend to tie off at the Railway Dock (1), which is located slightly further from town and named for its proximity to the White Pass Railroad track. No matter which dock your ship settles at, you’ll be within minutes of Skagway proper: Just walk toward the only buildings in sight (or catch one of the numerous shuttles that run between the docks and downtown), and soon you’ll notice that you appear to have fallen back in time to the turn of the 19th century! One of the first buildings you encounter as you cross into town is the Visitor Information Center (2), which is an important meeting place for several Skagway shore excursions. If you’re heading out in the field and aren’t meeting your guides directly at the cruise docks, this is likely where you want to be. Or maybe you’re heading out for a train-based tour of Yukon Territory? If so, instead head toward the nearby White Pass Railway Depot (3)! Don’t worry, it’s hard to miss: With several morning departures per day, the historic green and yellow White Pass train will make your destination obvious. If you have extra time later in the day and wish to stretch your legs, you’ll find a number of varyingly intense hiking trails in the immediate vicinity of “downtown” Skagway. Look for signs to Upper Dewey Lake if you’re looking to escape for a few hours. Otherwise, head across the bridge toward Yakutania Point (4), a gorgeous overlook out across Lynn Canal, for a short round-trip stroll along a well-developed path. Or, if you find yourself still short on things to do, you might want to work your way just north of Skagway’s main shops to Jewell Gardens (5), home to the fun and underrated Glassblowing Experience, as well as some of the most painstakingly maintained and lovely gardens in perhaps all of Alaska. For an even more in-depth Skagway Alaska map, or to access a historical self-guided walking tour map and information on nearby hiking trails, check out this website, maintained by the city of Skagway. Otherwise, check out the following Skagway Alaska map for some general information to help you orient yourself.